LG isn’t gonna let rival Samsung dominate the ridiculous smart refrigerator market. 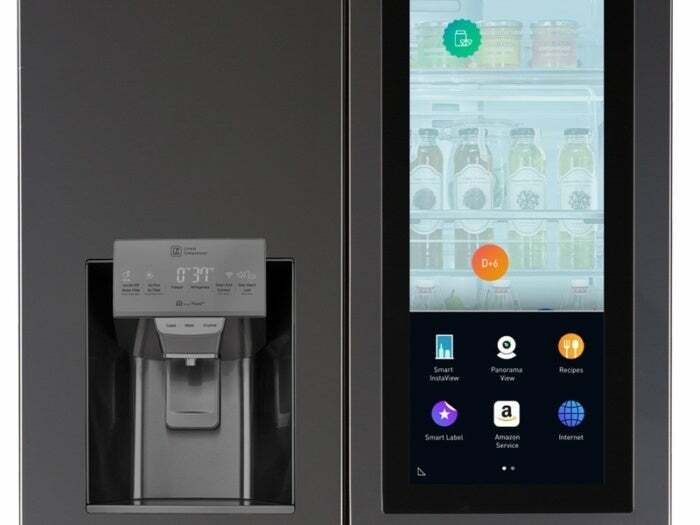 The company unveiled its own touchscreen fridge at CES on Wednesday with a bonus feature: Amazon Alexa integration, so you can do everything from stream music to place grocery orders with a simple voice command. Your move, Samsung. LG’s new WiFi-connected Smart InstaView door-in-door refrigerator runs on the company’s webOS platform, which was originally developed for TVs. A 29-inch HD touchscreen display is embedded in the fridge’s right door, allowing you to browse recipes, watch videos, write memos to family mamebers, and keep track of important calendar events like birthdays and anniversaries. The fridge’s left panel is the InstaView part—knock twice and you can see what’s inside without opening the door and letting cool air escape. Inside the fridge is a panoramic camera which sends super-wide images of your fridge contents to your phone so you won’t buy groceries you don’t need while on the go. Samsung’s Family Hub fridge has similar features, and just added voice commands, but it isn’t integrated with Alexa. That’s where LG could outmaneuver its competitor. Alexa can be tapped to add items to a shopping list, play music, or even buy groceries for you via Amazon Fresh. There are a few other convenient features, like a Smart Tag menu for adding stickers and marking expiration dates for items, which the fridge will then helpfully remind you of so you can ask Alexa to place a Prime order. LG didn’t give any pricing or availability details during CES. We’ve reached out to the company and will update with more information.